SINGAPORE -- ASEAN, a regional bloc consisting of 10 Southeast Asian nations, is Korea’s second-largest trade partner after China, and is expected to be the world’s fourth-largest economy by 2030, after the US, China and the European Union. 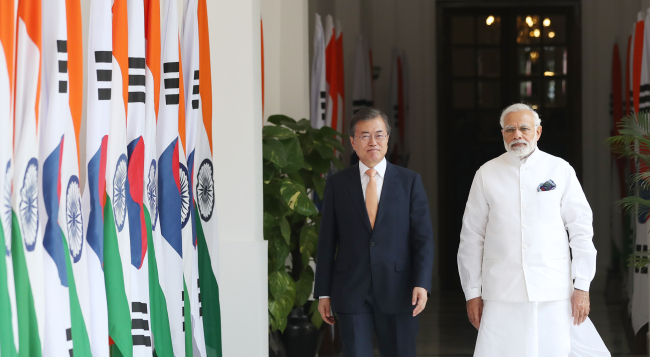 Through the Moon Jae-in administration’s New Southern Policy, Seoul seeks to expand cooperation and improve its relationship with ASEAN and India. “The New Southern Policy is a rebalancing policy to reduce the gap between political weight and economic weight on ASEAN and India in Korea’s foreign policy,” Korea University professor Lee Choong-lyol said in his presentation on the economic cooperation between Korea and ASEAN during a workshop here Friday. Academics from Korea and Singapore shared their views on enhancing economic and socio-cultural relations in the workshop titled “Closer Cooperation between the Republic of Korea and Singapore in the Era of Uncertainty,” which was co-hosted by the Institute for Southeast Asian Studies at Busan University of Foreign Studies (ISEAS-BUFS) and S. Rajaratnam School of International Studies at Singapore’s Nanyang Technological University. Having hosted the historic summit between US President Donald Trump and North Korean leader Kim Jong-un in June, Singapore is expected to play a bigger role in engaging Pyongyang, although its denuclearization will not be an easy process as Washington and Pyongyang have different “preference orders,” according to Korea University professor Shin Jae-hyuk, one of the presenters at the workshop. As various personal and cultural exchanges are underway between North Korea and Singapore, the Southeast Asian city state is likely to open many new economic and diplomatic opportunities for the DPRK. Singapore’s Ambassador Ong Keng Yong, executive deputy chairman of RSIS and former secretary-general of ASEAN, said Singapore seeks to be more “helpful and facilitative” in getting the reclusive state open up more to the world. “We need to find a way to encourage the North Koreans to come out more into regional forums and activities. Because they’ve been isolated for so long, they don’t have a profile within the region. Everyone knows about North Korea, but very few know what is their thinking with regard to economic development, international trade, about life after depending only on China,” Ong told The Korea Herald.